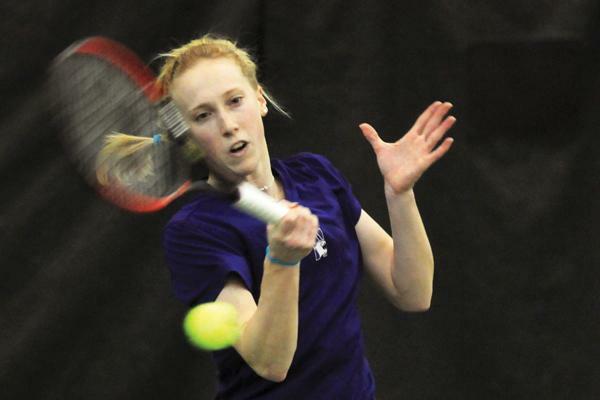 Northwestern senior Kate Turvy won both of her singles matches to help the Wildcats advance to the round of 16 in the NCAA Championships. Turvy won the deciding match Saturday against Baylor with a 6-3, 6-3 win over Victoria Kisialeva. Kate Turvy and Nida Hamilton led Northwestern’s victory march against Baylor on Saturday, helping the Wildcats win their 10th straight regional title. Hamilton breezed through her singles match against Baylor’s Alex Leatu 6-0, 6-2 while Turvy defeated Victoria Kisialeva 6-3, 6-3. “I just wanted to try and get out there … (and) get a point for my team,” Hamilton said. Turvy, ranked No. 57 nationally in singles play, found her match to be a bit more difficult. Throughout the season, Turvy has battled numerous injuries and has had to reinvent her serve multiple times. Last time NU faced Baylor, the Cats won 4-1 at the beginning of the regular season. On Saturday, nearly three months from their last meeting, the Cats took down the Bears 4-2. Not only were the single points important over the weekend, but NU needed the doubles point to win as well. The doubles point provided a bit of safety for the Cats going into the singles matches. Regardless, the Cats are headed downstate to in-state rival Illinois for the Sweet 16. Because the rest of the tournament is closer to home than in recent years, the Cats have more time to practice on their courts. This will be the first time any Big Ten school has hosted the NCAA Tournament. In the past, the tournament has typically been held at a school in a warm state such as California, Texas, Florida or Georgia. No. 11 NU will face off against No. 6 Miami on Friday in Urbana. Last time the two opponents played each other, the Cats got the best of the Hurricanes, winning 4-2 in February in Charlottesville, Va.